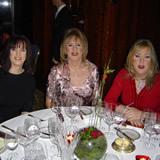 Jodie decided that this years xmas party was going to be a bit more upmarket than in previous years and made arrangements for us to eat at the Park Lane Hilton. The actual restaurant is called the room at the top of the world and is on the 22nd floor and you get a great view across Hyde Park and the whole of London. As the meal was at such a posh restaurant I thought it was time to visit Gemma’s shop and buy myself a new dress for the night. I tried on about 3 or 4 dresses and outfits, but chose the inventible little black dress, and I also got a silver necklace. I passed on the shoes and bag on this occasion. On the day of the meal I used up the last of my annual leave to give myself time to get ready, I had arranged with Nas to give me a lift home so I relied on good old public transport to get me to the Boudoir, unfortunately for me this meant a walk, British Rail train, two tubes and then another, and as you know trannies don’t travel light. As I knew it was going to be a long time before we ate I had stopped at the supermarket early on to top up with sandwiches, cakes and 7up, by the time I got to the Boudoir I had to have a rest. I finally arrived at the Boudoir and as usual found out that I was one of the first to be made over. Prior to that as it was the festive time of year it was time to give out my cards and presents, I received a new handbag from Jodie and that immediately got put to use. Gradually the Boudoir began to fill up and it was nice to catch up with my friends especially those who I had not seen for sometime, at one point during the proceedings we were actually ahead of schedule for the night, but in true Boudoir style we soon lost that, and it was the usual last minute panic to get on the coach (only 20 minutes late). Friday nights getting through central London is not the best journey, and just before xmas it is even worse, but we did not hit really bad traffic and eventually only arrived about 45 mins late. 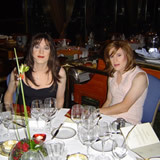 I had been into the foyer of the hotel before on one of our previous nights out and we had received one or two stares that night , so I was expecting quite a few more when the whole group of us arrived. I remember us cramming into a lift and a couple not in our group squeezed in and had to do a double take when they realised who they were in the lift with. When we stepped out of the lift, we put out coats away and went immediately into the restaurant, there were some stares initially, but then people just got on with there meal and forgot all about us. As there were about 20 of us the group was split up into two tables, and I was sitting between Tess and Sarah. We were also right next to the window so had a great view, it would be nice to one day return and see the view by daylight. After we eventually sat down the staff came over and immediately made us feel very welcome, I suppose they are used to strange sites in the restaurant, but its always nice when we get treated like a “normal” paying customer. I know its only a small thing, but having a personalised menu from the restaurant was a nice touch and it made everybody feel welcome. We had all decided our food a few weeks before, and had by then forgotten what I had ordered, but luckily the menu had our choices indicated for us. The food was very good, but if I had one complaint I would say it was a very small portion, but I suppose that’s noveau cusine for you. After the first course I had to visit the ladies, with Jodie and here I was very impressed without doubt it was the smartest toilets either male or female, I have ever visited, not only were the immaculate, but there were mirrors everywhere, together with chairs where you could sit and touch up your make up, so it was surprising how many trips the gurls made. 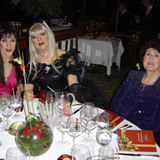 Once the meal was over and the liqueors trolley came round it was then time for the evenings entertainment which was a woman singing cover numbers, which was okay, the Boudettes then hit the small dance floor and we danced away until about 12.30 in the morning, when we firstly got a coach back to the Boudoir and then Nas finally dropped me home.